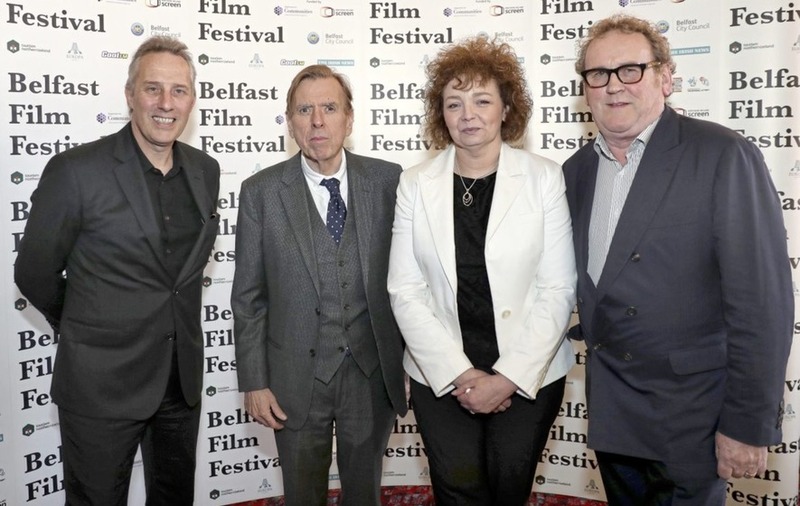 POLITICIANS were out in force last night at the UK and Ireland premiere of The Journey, a film about the relationship between Ian Paisley and Martin McGuinness which helped restore power-sharing a decade ago. Crowds turned out on a sunny evening in Belfast to get a first glimpse of the film at the Movie House Cinema on Dublin Road. Irish actor Colm Meaney plays former deputy First Minister Mr McGuinness, who died in March, while Englishman Timothy Spall stars as former DUP leader Mr Paisley, who died in 2014. The former IRA commander and unionist firebrand built an extraordinary friendship and became known as the 'Chuckle Brothers' after they agreed to share power in 2007. Mr McGuinness's Sinn Féin colleagues, MLAs Carál Ní Chuilín and Fra McCann, attended last night's premiere, as well as with DUP politicians including Mr Paisley's son Ian Paisley Jnr, Edwin Poots and Paul Givan and Alliance councillor Andrew Muir. 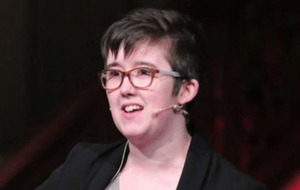 Speaking before the showing, organised by Belfast Film Festival and Movie House Cinemas, Ms Ní Chuilín said it "is going to be emotional", given her colleague's recent death. "This is first time Fra (McCann) and I have had the opportunity to see something like this," she said. She said since Mr Paisley stood down as first minister in 2008 the DUP and Sinn Féin have not had the same relationship. "I'm going into it (the film) with an open mind to see what it's about but primarily it's going to be about the relationship between the two men," she said. "I think the message is you have to have a relationship based on trust and mutual respect - even before seeing the film I imagine that'll loom large." Mr Paisley Jnr, who had already seen the film before last night's premiere, said he was proud to watch his father's life on screen. "I think it's fantastic that of all the stories they could have told about Northern Ireland they decided to choose part of my dad's life," he said. "I think it'll renew interest in the story. It is a fascinating story and a very, very impressive show. 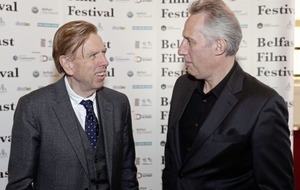 "Timothy Spall is a magnificent gentleman and he's done brilliantly well in trying to capture my dad. Colm Meaney - I loved him in Layer Cake - he was really, really good in that film so I've always followed his stuff and he did a great job in capturing McGuinness. "It's a film, it's not a bio-pic, that's not what it's about. Enjoy. Cinema is cinema." 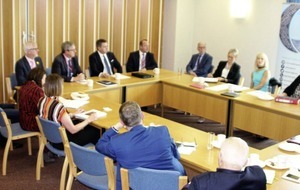 Mr Paisley Jnr added that the film did have a message amid the north's political stalemate. "There is an underlying text, an underlying message here which says we can do great things if we lead," he said. Earlier, Mr Meaney said he hoped the film could encourage the restoration of power-sharing. "We were seeing the film very much as a celebration of what had been achieved and that it would perhaps be inspirational to other conflict situations," he said. "But now we are back (to negotiations) maybe it could help nudge people here towards an agreement again." 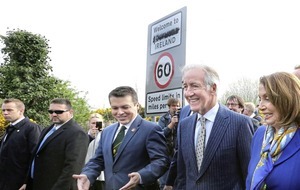 The Journey, written by Bangor-born author and screenwriter Colin Bateman, depicts a fictional car journey taken by Mr Paisley and Mr McGuinness after they left the St Andrews talks in Scotland in 2006. Mr Spall said Mr McGuinness's and Mr Paisley's stories are relevant to the current political situation. "If these two men representing the two opposite sides can do it, surely it has got to be a beacon for hope and a massive flare-up in the sky for keeping it going," he said. The actor, who met Mr Paisley Jnr and Mr Paisley's widow Baroness Paisley earlier yesterday, said the film was a take on what might have happened and did not purport to be real. "It is based on elements of truth but it is an example and a chance, a vehicle, to be able to get these two uncompromising men to hammer and tongs at each other, to tell each other what their problems were with each other and to face up to the simple fact that the only way forward was to come together and shake hands, and make sure that it was the end of it," he said.